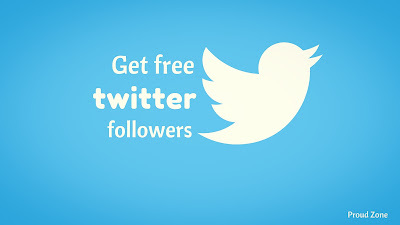 Are you on twitter❓ Are you looking for free followers, but you don’t know yet how to get. Right❓Well, you are on the right track. Before proceeding to the tutorial, I think, you might have many questions to ask like, can I get free followers on twitter❓ Is it safe❓ Is it to too hard❓ Well, yes it’s absolutely free of cost, its safe and its very easy method but remember, every easy or shortcut way has its own disadvantages. If you use twitter auto follower tool than you will get lots of followers at once but remember, your twitter account will follow them too. Another disadvantage is if you use it twice or thrice a day than twitter will put your account will be suspended as Facebook auto liker tool does, so don’t get carried away. Be carefully while using twitter auto follower tool and use at least once a day not twice as my recommendation. Twitter auto follower tool works completely online so you don’t have worry about downloading apps. You just need to click “Gain Followers Now!” button after logging into their application with your Twitter account. Their system gives you 20 free credits every day, you can gain 10 followers with your free credits. Your account will be suspended by their system and you will not be able to gain free fast followers anymore. They give 20 credits daily to all of their users. All credits are renewed at the end of the day. Yes, their system is a follower exchange system, user’s follows each other’s randomly. Their system can send some sponsor tweets from your profile. Only VIP users (who buy credits) do not follow anybody. Yes, just click on “Buy Credits” button to buy credits after logging in the system, you can spend bought credits whenever you want. Yes, you can gain more credits following by their sponsor users, do not unfollow their sponsor users, your profile will be suspended from their system if you unfollow them. 1. First of all go to www.google.co.in from chrome browser and then search for “Plus followers”and click on the first link of the search engine result page. 2. After opening the website, scroll down and click on the “Start Now” button. 3. Now you will be redirected to twitter sign page. Fill your information and click sign in. 4. Now you will be asked to click on “Authorize app” button, click OK and wait..! 5. Login successful, now wait for a minute..
6. Now open your twitter account, refresh it and see the magic!